It's one of the greatest, true detective stories ever. Featuring eight spellbinding missions, Nazi Hunters tells how a select band of secret agents and avengers hunted down some of the most evil men in history... And finally brought them to justice. Intense, visceral, and narrated by real-life Nazi hunters, every episode tells the story of one electrifying mission. And, from Klaus Barbie's dramatic pursuit in Bolivia, to the audacious Mossad operation to kidnap Adolf Eichmann in Buenos Aires, recounts how the Nazis finally met their nemesis. •Great value - 8 episodes for $19.95! Gerry and I took a great interest in this collection of stories.We have been watching a number of shows lately about Hitler,the Nazis and the Concentration camp Auschwitz.It was such a terrible thing what so many of these families went through that you learn about the secret agents and avengers that went after these men after the war was over and Hitler was gone. 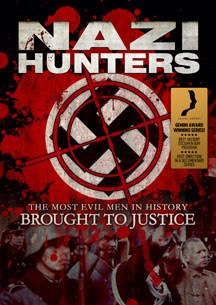 Nazi Hunters won the Gemini Award in Canada for Best History Documentary Program and Best Direction in a Documentary Series. The series launched on History Television in Canada on September 13, 2010 and ended on November 1, 2010. It also aired on The National Geographic Channel in the US and the History Channel in the UK. The trailer can be viewed here and is quite interesting for those interested in this part of history.